The Association of the United States Army Institute of Land Warfare Global Force Symposium & Exposition will be held March 26-30 at the Von Braun Center, Huntsville, Alabama. You will find NCS Technologies at Booth #130. 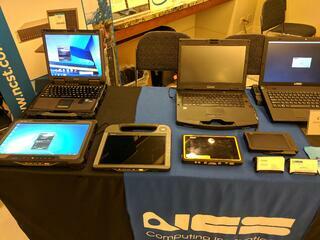 NCS will display its desktop virtualization solutions and the broad portfolio of rugged products from Getac. Getac rugged products on hand will include the B300 ultra rugged notebook, the V110 fully rugged convertible, the S410 semi rugged notebook and the F110 fully rugged tablet. Getac's B300 delivers high performance, security and long battery life. The notebook has one of the brightest displays in the industry and offers 4G LTE wireless. The V110 is a compact and lightweight fully rugged convertible that quickly transforms from an 11.6 inch display notebook to a tablet computer. The S410 semi rugged notebook delivers strong performance, security and durability in a thin form factor. The F110 fully rugged tablet offers a 11.6 inch screen and thin and light design. The NCS zero client portfolio leads the industry in manageability, reduced cost of ownership and improved security. VMware is our virtualization platform of choice. This platform improves availability, performance and utilization of IT resources. Please stop by to learn more about NCS desktop virtualization. Please bring all of your rugged and virtualization questions to Booth #130, where you can speak with our Army Sales Manager, Erin Dunn, 703-743-8639. To learn more about NCS zero clients solutions right now, just download this brochure.